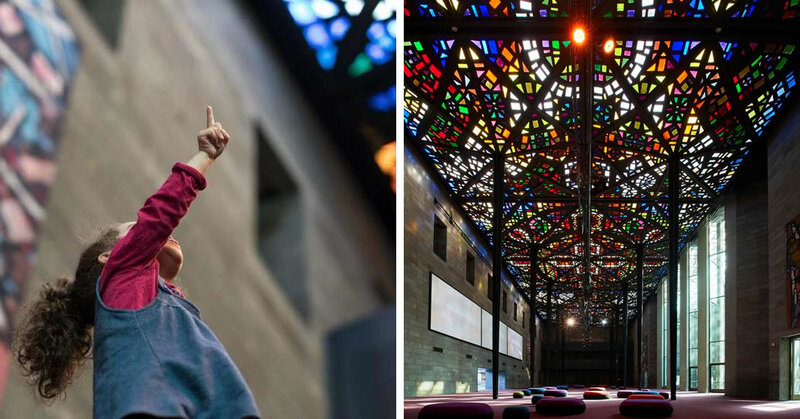 Personally, I think seeing the Great Hall and its amazing stain-glassed ceiling is worth the entry price alone in a visit to the National Gallery of Victoria. NGV International is one of two Victorian public art galleries within one magnificent arts precinct on St Kilda Road. The Grand Hall was opened on August 20, 1968. 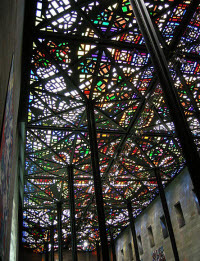 Its magnificent ceiling is the world's largest stained-glass ceiling, designed by Australian artist Leonard French. The ceiling is high (13.72 metres), vast (60.9 x 15.24 metres) and so heavy with glass and steel that its downward projecting triangles need to be held up by a series of slim steel columns. Each of the main intersecting triangles has been turned into thousands of geometric pieces of coloured and clear glass that have been cut so their facets bounce and refract coloured light. The 224 triangles of diamond-cut primary colours weigh 300 kilograms each. Many call it a Persian carpet of light! The Great Hall is a large capacity function area, perfect for a memorable gala dinner, grand wedding receptions or large scale cocktail events, The Great Hall has an area of 775 square metres, with a capacity of 600 (theatre), 750 (banquet), 680 (banquet with dance floor), 1400 (cocktail). 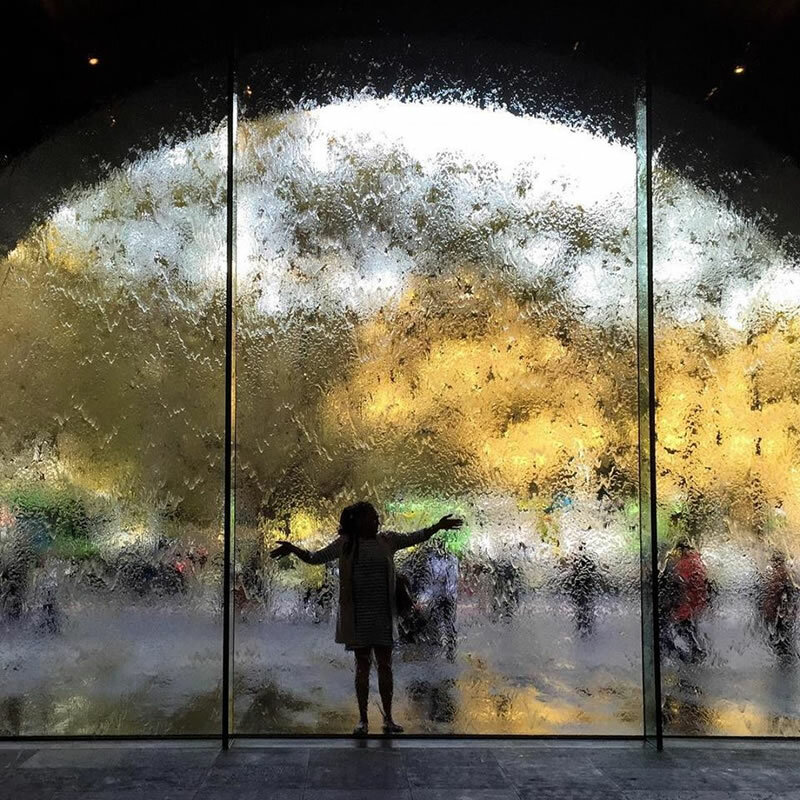 Is there a child in any of us that does not remember running our fingers through the streaming water flowing down the water wall? 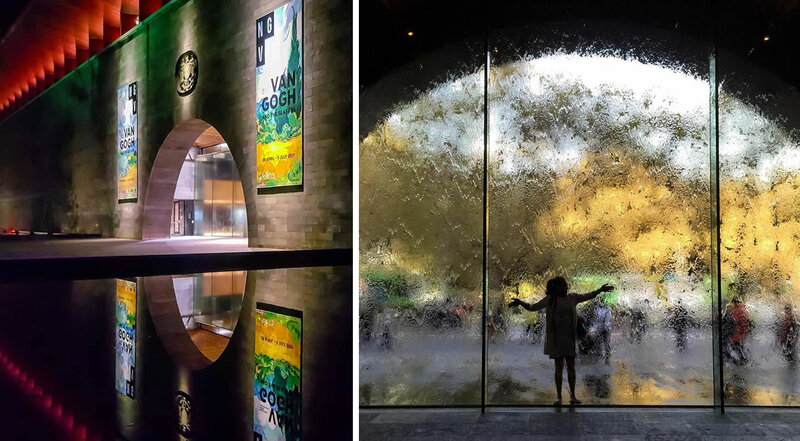 The Waterwall is located at the entrance to NGV International at St Kilda Road, Melbourne. It was the gala of the decade. On August 20, 1968, on a cold night, Melbourne's elite turned up to see the National Gallery of Victoria's new St Kilda Road building. Famed architect Sir Roy Grounds' daring modern design wowed, but when the doors opened to the Great Hall - the sound of trumpets bursting through - it was Leonard French's huge stained-glass ceiling that had people in awe. 'It was pretty terrific,' recalls French of the evening. He felt like a superstar in front of the thousand-plus crowd. Fashion enthusiast Lady Grounds (who French remembers fancying) wore a mini skirt while men were encouraged to wear their military decorations. Sir Henry Bolte, then premier, did the opening honours. French enjoyed working at night. He would place the glass on a light bench so the colours shone brightly. 'I used to smoke cigars called Old Port, which were tipped at the end with port,' he says. 'When I would get cutting the glass at night, I'd suddenly look down at the floor and I'd smoked the whole bloody pack.' He always called it a night when the radio announced midnight.